On Tuesday the 10th of February, a man by the name of Craig Stephen Hicks turned himself in to the police for the killing of 3 Muslims and has since been charged with three counts of first-degree murder. According to latest news, investigators are still looking for the motive of the heinous crime which some believe was a dispute over parking space between the young victims and their neighbour, Hicks. The Muslim Association of Britain expresses its strong condemnation of the shooting and consequent killing of the three Muslims in Chapel Hill, North Carolina. MAB offers its condolences to the family of the victims. 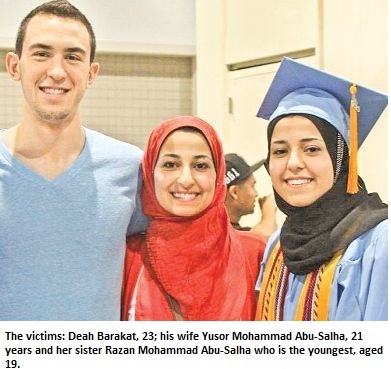 MAB encourages people to use the hashtag #MuslimLivesMatter to raise voices together for these young victims who tragically lost their lives to what seems to be hate-motivated murders. It is important that American Muslims feel safe living in the US as well as other Muslims in Muslim-minority countries.